The authentic Nitecore UM4 Intelligent Charger is a brand new intelligent USB four-slot charger with a total max output of 3000mAh. A single slot max output of 1500mAh and it is capable of charging 4 batteries simultaneously and controlling each slot independently. It only takes 2 hours to charge 80% of a 3,500mAh battery. The included LCD screen can display a real-time information of Battery Health by "Good" or "Poor", Internal Resistance, Charging Current, Battery Voltage, Charged Volume and Charging time. 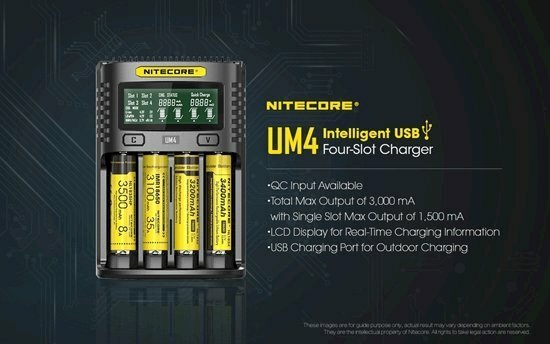 Moreover, the UM4 incorporates an optimized IMR battery charging program, which is able to monitor the entire charging process, ensuring that the cut-off voltage is always within safe limits to extend the lifespan of the batteries.